Jan 29 2019 ,Songwriter Robin Milby states, “This is a song that is different lyrically from the normal fare. My co-writer, Darrell Goodlett, and I wanted to pen a song that talks about God being a real 24/7 presence in our lives. So many times, I have gone to bed at night facing an obstacle the next day, whether it be at work, financial or relationship-based, that was so overwhelming to me that I knew it could not be fixed by me. 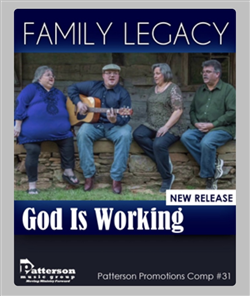 The release of “God Is Working” comes on the heels of Family Legacy’s first release from this project, “Faith Is All You Need,” which enters the Singing News chart at #78 for the month of March.